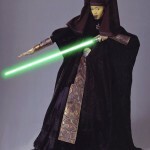 Luminara Unduli was a female Mirialan who served as a Jedi Master and Jedi General in the fading years of the Galactic Republic. She was a valued adviser to the Jedi High Council, the Supreme Chancellor, and the Galactic Senate. During the Clone Wars, she fought with her last Padawan, Barriss Offee, and she was a common and formidable presence at points of crisis, on worlds such as Ilum, Nadiem, and Geonosis. She was killed during the Battle of Kashyyyk when Contingency Order 66 was enacted. 1. Brown headpiece made of a matte fabric such as woolfelt or wool blend. The “wings” of the headpiece should extend out to almost the shoulder width and have the fabric drape down just past the top of the shoulder. Headpiece should have trim along the forehead and hem in a manner as close to the original costume as possible. 2. Skirt should be either black or a very dark brown lightweight dress fabric such as silk or cotton and is broomstick pleated. About 1.5″ above each seam of the circle tiers is 3 rows of rouched self fabric (lace is acceptable). 3. The shirt is black or very dark brown lightweight fabric. The shirt also has a center pleated panel that runs down the entire front of the shirt. 4. The cape fabric is a pattern of brown and dark brown (or black). Burn-out fabrics, prints, brocades, etc with a similar pattern or texture to the original cloak should be used. The cape has a large hood and the sleeves are constructed so that they appear to be bloused upward or slit. 5. Accurate leather single tabard and leather bracers that are carved and painted/dyed with a pearlescent quality to the paint/dye. 7. Accurate dark brown or black leather belt/double belt. Belt has two circular metallic antique gold/brass colored medallions. 8. Black face painted diamonds on pale very light greenish base makeup * fingernails are painted black, * lipstick is black on bottom lip only. 9. Accurate brooch at neck with dangles and an antiqued metal appearance. 10. Green bladed lightsaber – no toys.